The acclaimed drama stars acclaimed newcomer Daniela Vega, in the story of a young transgender aspiring singer who must confront society and her older lover’s family when he dies unexpectedly. Marina is a young transgender waitress and aspiring singer. A story of Marina and Orlando, an older man, who are in love and planning for the future. After Orlando suddenly falls ill and dies, Marina is forced to confront his family and society, and to fight again to show them who she is: complex, strong, forthright, fantastic. 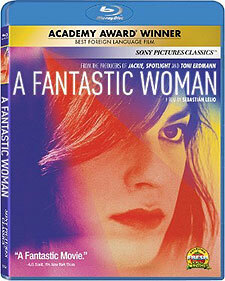 A FANTASTIC WOMAN was directed by Sebastián Lelio from a screenplay by Sebastián Lelio and Gonzalo Maza. The film was produced by Juan de Dios Larraín and Pablo Larraín, with Jeff Skoll, Jonathan King, Rocío Jadue, Mariane Hartard and Ben von Dobeneck serving as executive producers. Academy Award® and Oscar® are the registered trademarks and service marks of the Academy of Motion Picture Arts and Sciences. “Golden Globes®”, “Hollywood Foreign Press Association®” and “Golden Globe®” statuette design mark are the registered trademarks and service marks and the Golden Globe® statuette the copyrighted property, of the Hollywood Foreign Press Association.